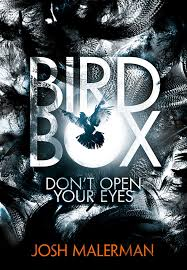 It seemed like everyone was talking about Josh Malerman’s debut novel, Bird Box, but it was still a surprise when it was chosen as our April read for book club. In the 15 years we’ve been together we’ve never read anything even resembling a horror story. I was really looking forward to this one because I love a scary book. Malerman doesn’t waste any time with preamble. That’s probably a good thing because Bird Box relies on a heavy dose of the unknown to make it tick. Something has happened to the world. The “Internet has blown up with a story people are calling ‘the Russia Report. '” People are behaving monstrously, attacking strangers and family members in gruesome ways (a mother buries her children alive) before ending their own lives. It’s a “the whole world’s going crazy” scenario, but it spreads from Russia to North America (and who knows where else) like wildfire. The only way to prevent doing harm to others and yourself is to prevent yourself from seeing whatever is out there. People hole up in their houses, windows covered, and if they must venture outside, they wear a blindfold. Bird Box bounces between Malorie’s perilous journey down the river in a boat (she’s heard that there is a safe community and after four years alone, she longs for something more for herself and her children who she laments “have never seen the sky. Have never looked out a window.” ) and her time in the house with a group of strangers she discovered through an advertisement in the paper. I can’t say I was fussy about the beginning or the ending of Bird Box, but I was seriously creeped out in the middle. There’s a scene when members of the house have to go out into the backyard to get water from the well. They have to be blindfolded, of course, and a rope is tied around their waist. The person whose job it is to go to the well must make the journey three times. On this occasion, it’s Felix’s turn. On the third and final trip from the house to the well he hears a sound. But now he can tell where it is coming from. It is coming from inside the well. He releases the crank and steps back. The bucket falls, crashing against the stone, before splashing below. Something moved. Something moved in the water. It’s moments like these when Bird Box is at its best. Like Malerman’s characters, we are blind and we realize that the scariest thing in the world is what we can’t see. This entry was posted in Book Chat and tagged 2015, book club pick, Book Review, horror, page turner, popular fiction, psychological suspense by Christie. Bookmark the permalink.